Eli Bennett arrives at Addo Records with a rich harvest of evocative music for tenor saxophone, ostensibly written very recently. The Vancouver-born tenor saxophonist has an easy way with a comprehensive range of musical materials, shifting seamlessly between speeds and creating absorbing narratives both dramatic and intimate. Mr. Bennett’s music is closely attuned to the rolling glissandos of contemporary saxophonists such as Chris Potter although the young saxophonist may be the first to admit that he worships at the altar of the elders such as John Coltrane and Sonny Rollins; even Coleman Hawkins and Ben Webster. But he is, nevertheless his own man who plays with a poetic intensity that drives a powerful and voluminous tone. His music too provides a compelling alternative way of understanding what his musical ancestors were trying to say. Mr. Bennett is one of a large group of young musicians who came out of Canada’s West Coast and were fostered by Cory Weeds at his legendary Cellar Jazz Club. The club is, alas, now closed, but the memory of it lives on in the bristling energy of musicians who passed through it. Mr. Bennett “speaks” in an accessible tonal style, with a knack for simple beauty backed by colourful, flexible, open and populist musical arsenal punctuated with occasional outbursts of musical fireworks that reside somewhere between Sonny Rollins and Chris Potter. On Breakthrough the excited swell of his glissandos and superb soaring arpeggios underscore the importance of composers recording their own music. His approach on this recording is to lay down lines of structure and dynamic range in which musical events can become organically embedded. Bassist Jon Maharaj does the lion’s share of the other voice and he too plays with passion and command as does the pianist D’arcy Myronuk. However, an ensemble of this kind is only as good as its other rhythmist and here Fabio Ragnelli acquits himself with flying colours. The one constant on this recording is Eli Bennett’s restrained, curious and positive playing, with a touch of the child approaching some wonderful music box—where even though the saxophonist is superb on all his compositions he is particularly poignant on “Giant Steps”. Here he lets the music’s hypnotic power just happen before it ineffably dies away at the end of the last chorus. It would seem from this exquisite deportment that Mr. Bennett immerses himself meditatively in the spiritual soaring and colours of “Giant Steps”, providing a reminder of how drop-dead gorgeous John Coltrane could make his young acolytes make the tenor saxophone behave. The other wonderful sequence of moments comes on “Forever” and the title track “Breakthrough”. The wonderful tensile energy operates on a subliminal aural screen behind the other main musical episodes of this album. Those and other tracks on the album are musical particle traces of the imaginary dancers’ and singers’ bodies that are the medium for the sage composer’s work. 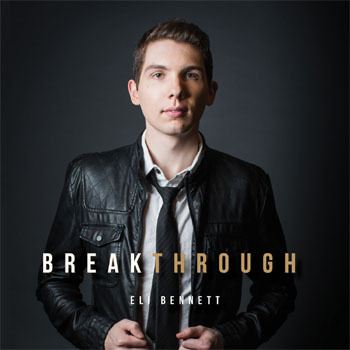 And Eli Bennett turns out to be a highly effective composer of music by virtue of a vivid aural imagination whose ingenious garrulous products are crafted into absorbing soundscapes that goes towards making this album sound superb. Track List: Let’s Roll; Vanishing Point; The Other Side; Step On It; Forever; Mistaken Perception; Giant Steps; Upside Swagger; Breakthrough.